Genesis tells us that Eden was a vast well-watered region extending from the Upper Nile Valley to the Tigris/Euphrates Valley. This was the center of the Afro-Asiatic Dominion and here the oldest known divine promise was made to Mankind (Gen. 3:15). Actually, that promise was made to "the Woman" (not Eve) concerning her Offspring who would crush the head of the serpent. To crush the head is an image of utter defeat. So this is a promise about the victory of the Son over all that the serpent of Eden represents. To better understand the Son's victory, we will explore what the Serpent of Eden represents in the context of the binary framework of Afro-Asiatic worldview in which the foremost distinction is always between the Creator God and the creation. This stands in contrast to religions in which this distinction is erased. The serpent motif is found in Africa, Arabia, Pakistan, India, Central Asia and the Americas. It is a significant symbol among traditional Africans and Native Americans, and in Judaism, Christianity, Islam, Hinduism and Buddhism. It is often found with symbols of the Sun and the Tree of Life. The great antiquity of these symbols is attested by their wide diffusion , yet their meaning has remained fairly stable in each religion. Among archaic peoples the serpent was regarded as having powers to communicate , to deceive, to heal, to hide, to reveal and to protect. The oldest serpent veneration is associated with the 70,000 year old python stone carved in a mountainside in Botswana. In Hindu mythology, the serpent-dragon RahuKetu tried to drink the nectar of immortality churned by the devas. The Solar and Lunar deities saw RahuKetu trying to do this and told Vishnu. Vishnu then threw his discus, cutting the dragon into Rahu (head) and Ketu (below the head) , but the dragon had already consumed the nectar and was thus immortal. Essentially, the serpent takes on divinity. In the Gilgamesh Epic (Babylonian tale) Gilgamesh retrieves the Plant of Rejuvenation from the bottom of the sea. One evening as he was bathing in a pool, a serpent appeared and ate the Plant that Gilgamesh had left on the shore. The serpent then sloughed its skin and disappeared. Here too is the implication that the serpent becomes immortal. In Buddhist mythology, Buddha is often shown meditating under the hood of a seven-headed serpent (naga in Sanskrit; nahash in Hebrew). The serpent protects him from the rain. In another story, the celestial nagas shower the earth with rain as a blessing. They are deities in Buddhism, no longer simple creatures. Jesus thought of the serpent as a creature with both positive and negative qualities, but never as an immortal being. He used serpent imagery to condemn the hypocrisy of the Jewish rulers: "Ye serpents, ye generation of vipers, how can ye escape the damnation of Gehenna?" (Matthew 23:33) Yet earlier in Matthew's Gospel He sent forth his Apostles with this exhortation: "Behold, I send you forth as sheep in the midst of wolves: be ye therefore wise as serpents, and harmless as doves" (Matthew 10:16). The ancient Greeks considered snakes sacred to Asclepius, the god of medicine. Asclepius carried a staff with one or two serpents wrapped around it. This has become the symbol of modern physicians. The ancient symbol of Ouroboros consists of a dragon or a snake curled into a hoop, consuming its own tail. In this image the serpent represents the eternal cycle of life. As snakes shed their skins, revealing shiny new skins underneath, they symbolize rebirth, transformation, immortality, and healing. In his novel The Voyage of the Dawn Treader C. S. Lewis uses this image to describe how sin can be sloughed only with Aslan's help. Eustace has turned into a dragon  and before he can step into the waters (Baptism) he must shed his scaley layers. He sheds three layers but can't free himself to be the human he was originally created. Aslan must rip away the layers of sin before Eustace can step free. In ancient Egyptian mythology, Apopis was a water serpent and a symbol of chaos. 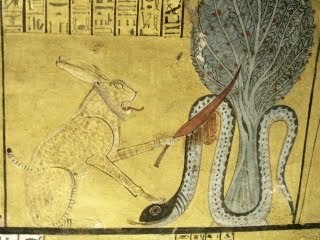 He is shown (right) being slain by Hathor, Ra's cat. Another story tells of how each night Apopis attacked Ra, the High God, but the serpent Mehen coiled himself around Ra's solar boat to protect Ra. This also illustrates the binary nature of ancient Egyptian thought, since the power of Mehen to protect is superior to the power of Apopis to destroy. This binary element is key to understanding the victory of Jesus Christ, whose victory is assured because He is one with the Father, not a creature. In Exodus we read how Moses held up a rod which turned into a serpent and all who looked upon it were spared when they were bitten by vipers. The exalted Serpent was superior in every way to the serpents who attacked the Israelites in the wilderness. The Church Fathers interpreted this as a sign pointing to Jesus on the Cross. The Apostle John had this in mind when he wrote about how Jesus would be "lifted up from the earth" and thereby draw all Mankind to the Father (John 3: 14 and John 12:32). The serpent of Eden symbolizes deception, the promise of forbidden knowledge and self-elevation. It is not a deity, but it is "more cunning than any beast of the field which the Lord God had made." Nevertheless, the serpent of Eden is very much a creature. The distinction between the Creator and the creature is clear. The rabbis identify the serpent of Eden as Satan, the one who decieves and accuses 364 days of the year. Only on Yom Kippur is Satan not able to accuse. That is the Day of Atonement. For those who believe that Jesus is the Son promised to the Woman in Eden, that is the day of Christ's atoning work on the Cross. That day the Crucified One ripped away the great deception so that we who believe in Him might step free. 1. The "Woman" of Gen. 3:15 is Mary, the Mother of Christ, our God. She is sometimes shown standing on a hemisphere with the serpent beneath Her foot. 2. Diffusion is the process by which a cultural trait, material object, idea, symbol or behavior pattern is spread from one society to another, often traceable to a central point or a point of origin. A principle of anthropology states that the wider the diffusion of a culture trait, the older the trait. The point of origin for serpent veneration appears to be southern Africa. 3. Shinto shrines have snake pits where shamans go into trace states to communicate with the serpents and to communicate a message to humans from the serpent. 4. Ketu is the name of one of the 3 founders of the Jebusites. There are two Jebu territories and three founding brothers: Yoruba, Egba and Ketu. This 3-clan patriarchal confederation is typical of Abraham's African ancestors. 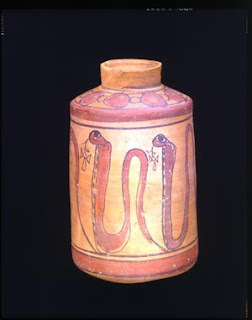 Jebusite influence is reflected by the presence of the bronze serpent in the Israelite cult with many such serpent images having been found at Canaanite shrines in Gezer, Hazor, Meggido and Jerusalem. 5. In Christian iconography the serpent of Eden is often shown as a dragon. Many famous paintings depict the serpent's defeat by either St. George or St. Michael, the Archangel. Great post! I was wondering if there is anything to the idea of the serpent being phallic in nature, because he was trying to impregnate his "seed" in eve? Have you thought about this aspect? I heard this from a Protestant bible teacher some years ago, and was wondering if there was anything to it. Love the posts, please keep this up. In the Biblical worldview there is a distinction between humans and animals and sexual relations between them is absolutely forbidden because it is a violation of the order God established in creation. There is therefore nothing in the Bible to support the bible teacher's statement. That idea probably came from a commentary he read. Fertility symbols among Abraham's people were sacred pillars. In Hindu temples and shrines these phallic symbols, called lingum, are placed in the yoni (symbolic female organ). The female organ was never displayed among Abraham's people. In the Biblical worldview such a display would be to dishonor the woman. I would be interested to hear your thoughts about the rest of the sentence given to the serpent in Gen. 3:14-15 -- How is the serpent going to "eat dust" in the aftermath of receiving this curse? What "enmity" would exist between him and the "Woman" (pointedly, in regards to the Woman, in distinction to, say, the enmity that obviously exists forever between Satan and mankind in general)? And, who do we see gaining advantage in vs. 15 -- Is it: "you (Serpent) shall be on guard for His heel" -- (LXX)? Or is it "you shall bruise His heel" (RSV and others)? The serpent casts doubt about God's Word. The Woman brought forth the Living Word, proof that the original Edenic promise was true. The serpent tempts us to look only on the outer appearance and believe that the material is all there is. Satan is the ultimate materialist. Mary, seeing that the wine was depleted at the wedding, told the servants to do as her Son directed. She expected a miraculous provision. She saw beyond the material. The serpent suggests that God isn't good. Yet all of creation testifies that what God has made is good and reflects God's goodness. 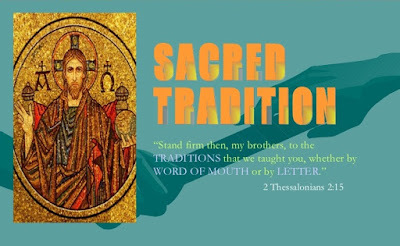 Mary acknowledged God's goodness when she agreed to become the mother of Christ our God. The serpent seeks to invert God's order of creation. Think of a pyramid with God and Heaven at the pinnacle and humans on the level just below God. The last to be created was the woman, so in a sense she is the "crown" of creation. By bringing her under the authority of a creature who slithers on the ground (at the bottom level) the serpent brought Eve down to its level, but not so with Mary. She is the true crown of creation as the Theotokos. The humble maid who is highly exalted. To eat dust is a figure of speech that indicates defeat or being left behind to eat the dust of the departing Victor. Satan’s "children" will be at enmity with the offspring of "the woman". The "woman" to whom this refers can’t be Eve as Eve is not named until Genesis 3:20. The "offspring" can’t refer to the human race since, according to Apostolic teaching (especially John) humanity is Satan's captive. Therefore the woman's "offspring" must refer to a specific Person. As Jewish commentators are quick to point out, there is a hint that it applies to more than Christ. It must include those, who redeemed and made new by His Blood, share in His ultimate victory. So it is that Mary is regarded as the Mother of Jesus Christ AND the mother of the Church. "You (Serpent) shall be on guard for His heel" is an interpretation. The most recent Hebrew recension says "I put enmity between you and the woman, between your seed and her seed: THEY will bruise you on the head, you will bruise THEM in the heel." This distorts the Messianic message, shifting the focus from the Promised Seed to the people of Israel. The Jerusalem Bible, which closely follows the Masoretic text, here follows the Septuagint instead, recognizing that this fits the original promise of a Son to be born who will defeat the serpent, restore Paradise, and receive and eternal kingdom from the Father. This is the Messanic expectation which is first found among Abraham's Horite ancestors. This Faith of Abraham took second place to the Land claim after the Jews returned from Babylonian captivity. The recent Hebrew recension appears to have been influenced by the Babylonian Talmud. I have been reading alot of your posts,and I must say they're quite fascinating. In one I read, it stated you developed a study guide for Genesis. For a 15 week study of the book. Is this still available, and if so, how might one obtain it? Your studies, and essays are very good, and I am edified every time I read them. Thank you. Dave, I'm delighted that you are enjoying the essays at Just Genesis and finding them edifying. The key research in that Study Guide is available at Just Genesis. If you are looking for something in particular, use the INDEX. Again, thanks for being a faithful reader! There are 3 Eden (Eden derives from 'aden' which means 'to mine ore' in Arabic) characters associated with serpents: Yhwh, Eve's serpent, and Eve. The ancient West Semitic word for serpent is hw or chw. The name appears in the word Yhwh and Chawa or Eve. Nachash, the Hebrew word for snake, is borrowed from the Vedic word 'nagas' which means cobra. The word was borrowed from the Mitanni kingdom to the north. Eve's serpent is the Sumerian god Ningizzida who was a god of magic and healing. He was the Sumerian divine snake guardian of the tree of knowledge of good and evil (Gen 2:9) who is often portrayed as a man with 2 snakes protruding from his shoulders as well as a caduceus (double helix snake wound around a pole or tree). His name means ‘guardian of the good tree’ in Sumerian. The Sumerians worshipped him as a god of both healing and magic. In the Bible, Ningizzida’s tree of knowledge represented the knowledge of good and evil magic. Because of his human alter ego, this serpent was able to speak to his fellow garden residents. He attempted to share with them knowledge of healing and magic which would have made them immortal (Gen 3:4). This knowledge would have made these inhabitants divine equals of both Ningizzida and his fellow resident divinity, YHWH (Gen 3:5 & 22). YHWH opposed this scheme, crippled Ningizzida and expelled Adam & Eve from the garden (Gen 3:14 & 23). Serpent symbolism is widespread across the ancient Afro-Asiatic Dominion. Psalm 68 is one the oldest Psalms in the TaNaKh (Old Testament) which Biblical scholars have dated to the time of Judges or circa 1200 BCE. Yah’s name is written in the Negev inscriptions as a snake’s head with a protruding forked tongue. (Old Negev script Y + H, which is written: >—–O). According to Dr. James R. Harris, the Hebrews carved YHWH’s full image as a ‘radiant serpent’ among these inscriptions. Harris’ conclusion that the early Hebrews were responsible for these inscriptions is supported by the many carvings among these inscriptions of what later became known as the Jewish menorah. These inscriptions date to circa 1200 BCE. YHW: Yah/Ya was recorded as Yhw in the Soleb Temple by the ancient Egyptians as the god of the Shasu (Bedouin in southern Canaan or the Midianites). Yhw was adopted by the Hebrews through the Midianites where he became known as YHWH or YHWY in Arabic. ‘Ya’ or ‘Yh’ is thought to be the Sayhadic (Old South Arabic) word for an ancient Semitic word for life or ‘hy’. In Sayhadic ‘hy’ would be written as ‘yh’. The ‘h’ in Sayhadic was the definite article ‘the’ written as a suffix to the word ’y’. In Hebrew, the definite article ‘h’ is written as a prefix. Thus, the word YHWH is written as the word Y + the word ‘hwh’; both words mean life and snake. ‘Hawa’ is the ancient west Semitic word for snake, which in Arabic is ‘hyh’ (haya). Hwy in Arabic means to coil. (The ‘w’ and the ‘y’ are interchangeable in Semitic languages). So, YHWH/YHWY means ‘the living snake god’ or ’Ya, the coiling one’. This god originated as a serpent cult . His ophic (snake) image was carved by the Hebrews on their Beersheba altar (800 BCE) and on the Galilean Migdal synagogue stone, which existed as part of that synagogue during the time of Jesus.